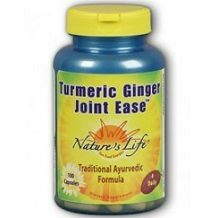 The following is our review of Nature’s Life Turmeric Ginger Joint Ease. It is a dietary supplement made with turmeric and ginger to provide nutritive support for healthy joint function and normal flexibility. As we age, our cartilage surrounding our joints gets thinner and thinner. This product is supposed to help strengthen that cartilage. Continue reading for our full review. Other ingredients include gelatin, silica, and magnesium stearate. 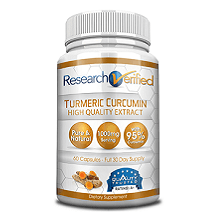 Curcumin is the main active ingredient found in turmeric. It has anti-inflammatory effects and is a very strong antioxidant. Since arthritis usually involves inflammation in the joints and turmeric has anti-inflammatory properties, it has been shown to be effective in treating arthritis and joint pain. Ginger also has anti-inflammatory and anti-oxidant properties. Ginger has been shown to be beneficial in treating digestive or heart conditions, in addition to arthritis. It is recommended to take 4 capsules daily with food. For the best results, take 2 capsules at 2 separate times. There seems to be only 25 servings per container meaning 1 bottle won’t even last you a month. Do not use this product is safety seal is broken or missing. Keep out of reach of children. Do not use if you are pregnant or have bile duct obstruction or gallstones. Consult with you doctor before using this product as well as any other supplements. Nature’s Life Turmeric Ginger Joint Ease can be purchased from the manufacturer’s website for $28.59 for a bottle that will only last you 25 days since it has 100 capsules. The same size bottle can be purchased from iHerb for $17.16. This product is backed by a 100% satisfaction guarantee. You may return your product within 30 days of purchase. The date the product shipped is the date of purchase. Only 1 open package of a return will be eligible for a refund. If you have more bottle of the product, they will need to be in original condition to receive a full refund. Opened or damaged items may only be eligible for partial refund or merchandise credit. There are a couple of positive things about Nature’s Life Turmeric Ginger Joint Ease. It comes with a pretty strong guarantee. It allows you, the customer to actually try the product for a little bit and then hopefully still qualify for a refund if you are not satisfied. Many customers said that they have noticed a huge difference since using this product. It was able to help their arthritis and loosen up their joints. This product has a couple of negatives as well. Since the recommended dose is 4 capsules a day, this product ends up being more on the expensive side. There were some customers that reported only taking 2 a day, so that’s an option if you want to save money, but we can’t guarantee it will be an effective dose. One customer even said that other products have worked better for them. We feel you can find a better product elsewhere.